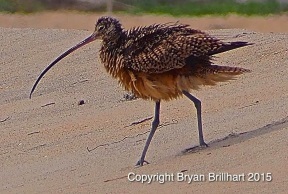 An Imperial Beach Hidden Gem and Bird of the Week, Bryan Brillhart Photography present the “Dig IB” Bird of the Week, the “Long-Billed Curlew"
which is longer on adult females than on males or juveniles. It is mottled brown overall, with cinnamon underwings. 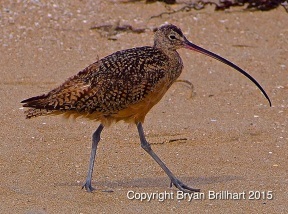 It is similar in size, shape, and color to the Marbled Godwit, but the curlew's decurved bill distinguishes it from the upturned bill of the Marbled Godwit. 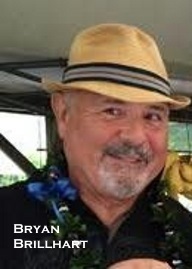 The species is native to central and western North America. In the winter, the species migrates southwards, as well as towards the coastline. a depression in the ground for nesting. Once the depression is formed, materials such as pebbles, bark, animal droppings, grass, stems, twigs, and seeds are all possible materials used for lining the nest, which is about 8 inches across and 3 inches deep.